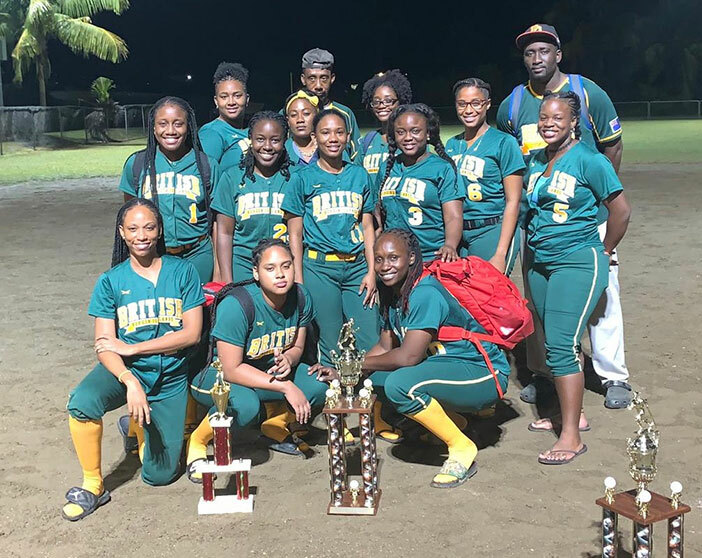 A BVI Women’s Softball team outslugged host St. Croix, 15-10, to win the VI Kings and Queens weekend Softball tournament. Kenisha Powell pitched team to victory. It was the second victory for the Women’s team, after winning a tournament held in Anguilla in November. Che’Vauhne Richardson was named the tournament MVP. The team began play on Friday with a 7-1 win over St. Thomas’ Griffith Park Massive, who won the Raymundo “Mundo” Boynes Tournament on Sept 3, 2017, during the last softball games played on Tortola before Hurricane Irma struck on Sept 6 and destroyed the E. Walywn Brewley Softball Park. In a head to head battle on Saturday, the BVI Women fell to their St. Croix counterparts, 7-6. The Men’s team opened with a 5-4 triumph over the St. Thomas Tigers on Devin Bedford’s walk off homer, before falling to the Griffith Park Massive 8-7 in their next game. They did not advance to the final. Franklyn Penn of Panola College had two points, two steals and an assist, during his team’s 64-62 loss to Kilgore College. Coming off a 43 points game in his last outing, State College of Florida’s D’Moi Hodge had six points, 12 rebounds, eight assists, three steals and three blocks, in their 95-65 win over Impact Academy. Eral Penn narrowly missed a double double with 12 points and nine rebounds in Long Island University of Brooklyn’s 79-77 win over Fairleigh Dickerson. He followed up with six points during a 79-70 loss to St. Francis. Husson University’s Kyanti Blyden contributed two points, four rebounds, three assists, two steals and two blocks, in their 101-98 loss to Colby. In Canada, Joy Victor of St. Mary’s University, had eight points 11 rebounds, two assists and a steal, in their 77-52 win over Ambrose. She completed the double header victory with six points, seven rebounds and three assists.